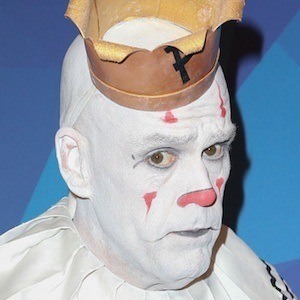 Singer who performs as the silent and sad clown, Puddles Pity Party, leading the band Kingsized. He first stepped on the national stage at America's Got Talent in 2017. He started his career in entertainment in the 1990's as the front man for the Swing Noir band The Useless Playboys. He performed as his character Puddles Pity Party for Aqua Teen Hunger Force's 2010 tour. He has over 110,000 followers on Instagram. He grew up with two brothers and four sisters, all of whom grew to be at least 6 feet tall. He grew to be 6'8." He found viral fame by singing Lorde's "Royals."